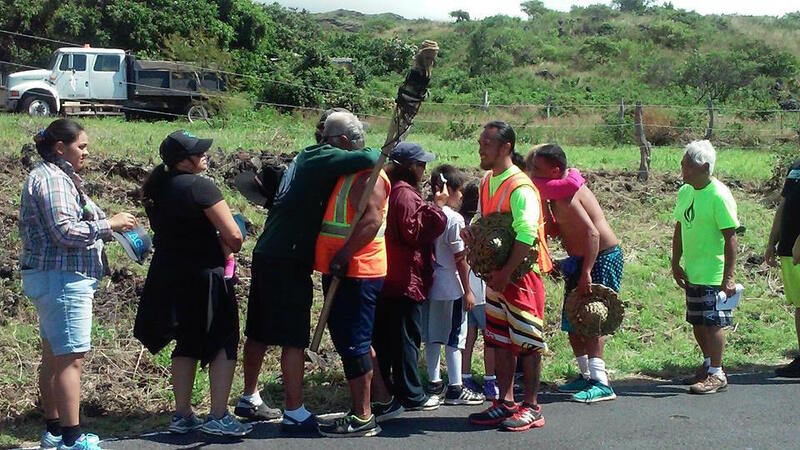 Ka’apuni Ku’e kakou na moku aina or the Torch March was mainly steer-headed by an initiative our Maui Kupuna (elders) have been involved in since 2006. It reintroduces awareness on Maui of a tradition of our past, today known as the Aha moku system. Passed in the Hawaii Legislation and signed by then Governor Linda Lingle in 2007 this legislation allowed the people of Maui a process that is based on traditional land and ocean resource management. The torch signifies the re-igniting of an old tradition, which allows a bottom to top management process from the community to the government agencies on best management practices based on generational knowledge. The Torch March in 2009 was called Ka’apuni I ho’a kukui na moku aina and enabled Maui to form an advisory council made up of 12 representatives of each moku (district) to address their community’s concerns. Similar to how it was done generations ago during the time of Kau (summer solstice). The ceremonial lighting of the torch (kukui) was conducted on the sacred grounds of Moku’ula in Lahaina, the capital of the Kingdom of Hawaii. Over 2 thousand people participated back in 2009 (the last time the march was held), many mokus extended their hospitality by preparing meals for the marchers. Communities came out to support and were welcomed to carry the torch for it resembled a beacon of hope for all. On February 28, 12:00 midnight in Lahaina on the grounds of the sacred island of Moku’ula we will again ceremonially ignite the Torch (kukui). This ceremony will be conducted by Kahuna nui o Pu’ukohola Kapono’ai Molitau and Nahonona kulike a’o pi’ilani with assistance from Nakoa kau I ka meheu o na kupuna o Lahaina. It will begin a seven day/night, 197 mile circumference march around the island roadways, which we hope will bring awareness to all Hawaiians and Hawaiians at heart of the issues we all face together such as, water issues, land rights issues, over development and mismanagement of land that has no regard for our fragile environment. We are hoping this march will help highlight the issues we face and unite us, to Malama Aloha Aina, and follow a path of unity and righteousness. All are welcome to participate, by either joining us on our walk anywhere along the route or helping with logistics such as roadside security, first aid, water, food etc… You can contact me at 298-5639 for more information or attend a meeting we will be hosting periodically throughout Maui. These meetings will be announced either by radio, newspaper and Facebook (look for posts on The Maui Mama Magazine FB page). We want to provide as much input to the moku communities so everyone will be prepared and can participate in this tradition while we carry the torch uniting our community. Our hopes are to take to the roadways as we did in 2009 this year also to invoke the image of Lono Makua and the Ku’e petition to do a circumference walk around the island of Maui and send out a message of unity to all that it is the time to rise up and Aloha Malama Aina. Because of the onslaught of political issues we face here on Maui such as; Water issues, Land right issues, the degradation of our resources being controlled by private corporations and tainted political favors, our intent is to provide a clear message that Hawaii needs to find remedy of our cultural, spiritual, and political status as Hawaiians and for all who chose Hawaii to be their home. That in order to remedy the issues we face it can only be accomplished by truly understanding what happened in the past and how we need to remedy that today. We also need to ensure that we no longer except status quo in our efforts to achieve self reliance, good governance, cultural integrity, economic viability, and organizational reliability. We are very confidant that we now have the necessary leadership and human resource capacity to make measured progress, to fulfill our vision To assist us to strengthen our resolve to follow a strategic plan, we need to institute the cultural, traditional, linguistics and spiritual elements back into our roles as leaders and helpers in carving out our rightful place here in Hawaii. What we need now is for us to demonstrate our resolve through unity and clarity of purpose in serving the interest of our people, with the 1897 Ku’e petition, and the questions forth coming on the native Hawaiian political status. We call upon all our leaders and our people to join hands so that we journey towards our destiny proud, happy and United. Next articleLaughter is the best Medicine! Ke'eaumoku Kapu is a traditional taro farmer and has served on multiple cultural and historical boards for the past 15 years. He is Currently Chair for the Native Hawaiian Historic Preservations Council, an advisory to the Office of Hawaiian Affairs and is also the Cultural coordinator for Na'aikane o Maui Cultural Center in Lahaina and at the same time malama aina i kekai (care for the land and the sea). You can contact him at 298-5639.